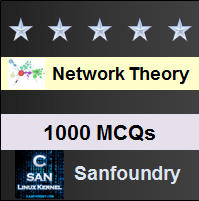 This set of Network Theory Multiple Choice Questions & Answers (MCQs) focuses on “DC Response of an R-C Circuit”. 1. The current in the R-L circuit at a time t = 0+ is? Explanation: The capacitor never allows sudden changes in voltage, it will act as a short circuit at t = 0+. So the current in the circuit at t = 0+ is V/R. 2. The expression of current in R- C circuit is? Explanation: The particular solution of the current equation is zero. So the expression of current in R- C circuit is i=(V/R)exp⁡(-t/RC ). Explanation: In a R-C circuit, when the switch is closed, the response decays with time that is the response V/R decreases with increase in time. 4. The time constant of an R-C circuit is? Explanation: The time constant of an R-C circuit is RC and it is denoted by τ and the value of τ in dc response of R-C circuit is RC sec. 5. After how many time constants, the transient part reaches more than 99 percent of its final value? Explanation: After five time constants, the transient part of the response reaches more than 99 percent of its final value. 6.A series R-C circuit consists of resistor of 10 and capacitor of 0.1F as shown in the figure. A constant voltage of 20V is applied to the circuit at t = 0. What is the current in the circuit at t = 0? Explanation: At t = 0, switch S is closed. Since the capacitor does not allow sudden changes in voltage, the current in the circuit is i = V/R = 20/10 = 2A. At t = 0, i = 2A. 7. The expression of current obtained from the circuit in terms of differentiation from the circuit shown in the question 6? Differentiating with respect to t, we get 10 di/dt+i/0.1=0 => di/dt+i=0. 8. The current equation in the circuit shown in the question 6 is? Explanation: At t = 0, switch S is closed. Since the capacitor does not allow sudden changes in voltage, the current in the circuit is i = V/R = 20/10 = 2A. At t = 0, i = 2A. The current equation is i=2(e-2t)A. 9. The expression of voltage across resistor in the circuit shown in the question 6 is? Explanation: The expression of voltage across resistor in the circuit is VR = iR =(2(e-t ) )×10=20(e-t )V.
10. Determine the voltage across the capacitor in the circuit shown in the question 6 is? Explanation: The expression of voltage across capacitor in the circuit VC = V(1-e-t/RC) =20(1-e-t)V.